MELBOURNE, FL – Gov. 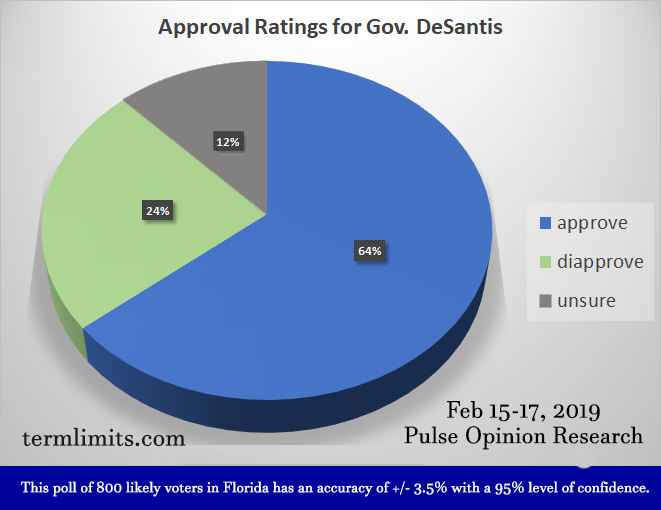 Ron DeSantis is one of the most popular governors in America*, according to a new poll conducted by Pulse Opinion Research for U.S. Term Limits. Statewide, 64 percent of Florida voters approve of the job DeSantis is doing, versus just 24 percent who disapprove. Support for DeSantis is broad across nearly all political and demographic groups. Among Republicans, 85 percent approve of the Governor while 10 percent disapprove. Among independents, 60 percent approve and 23 percent disapprove. DeSantis is even performing well with Democrats, garnering 46 percent approval versus 39 percent who disapprove. Additionally, DeSantis’ net approval is higher with Hispanic voters (62%-20%) than among the general public. Overall, 62 percent of Hispanic voters, 68 percent of white voters and 40 percent of African-American voters approve of DeSantis. This Pulse poll of 800 likely voters in Florida has an accuracy of +/- 3.5% with a 95% level of confidence. CLICK HERE to view Executive Summary with full poll results, including crosstabs for age, gender, race, education level, income level and ideology. * The top five governors of 2018 Q4 had ratings of 60% and above according to Morning Consult.